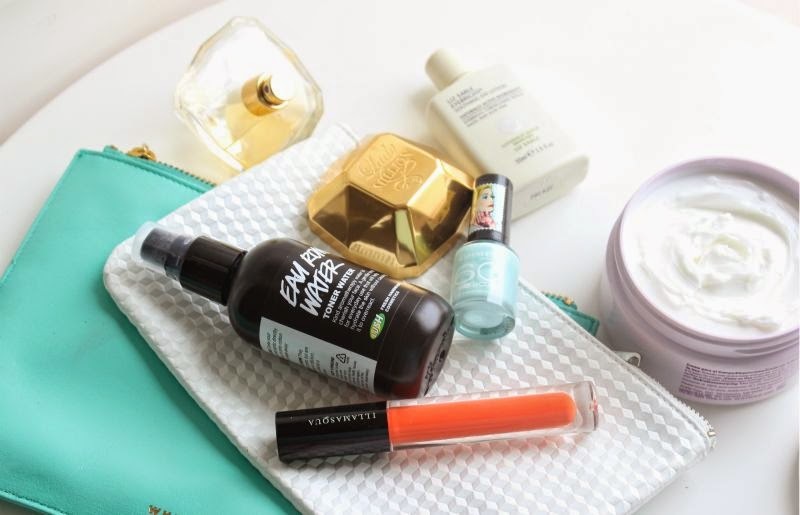 Lush Eau Roma Toner Water is the one product I can not live without at the moment. Glasgow has been really muggy as of late and my skin has not been enjoying it one little bit. I haven't been using Lush Eau Roma Toner Water as a typical toner but rather I have been misting it on to cool and calm my skin throughout the day. Spray on toners can be a little hit and mist but this bottle features a super fine mist that doesn't soak the skin meaning you can apply it on top of make-up to cool down throughout the day. My bag has not been without it - a must have for the summer in my book! As mentioned I have been having one of those weeks in which I can't make my mind up about certain products - one of which is Paco Rabanne Lady Million Eau de Parfum. At time I love this deep floral and then at others I find it to be a little too heavy and sickly. When I am enjoying this fragrance I love that I can apply it first thing in the morning and come evening it is still lingering on my skin. On the other hand it can irk me for the very same reason. Some times you just can't win! The muggy weather has resulted in some restless evenings, countless moths fluttering in and out of my window and a new found obsession with Aveda Stress Fix Body Cream. I only use the smallest amount of this luxuriously thick body cream and rub it onto my pulse points before popping into bed. Okay it doesn't cool me down by any means but I find the blend of natural oils such as lavender and clove help me to relax and unwind resulting in a better sleep. Hayfever how I loathe you! My eyes are constantly red, itchy and streaming. Of course anti-histamines help to a certain extent but I find my eyes really benefit from Liz Earle's Soothing Eye Lotion. At the end of each day I like to soak two cotton pads with this cooling and calming liquid, apply and lie back for a few moments of relaxation. Liz Earle Soothing Eye Lotion cools, calms, reduces redness, puffiness and generally just makes my eyes feel and look oddles better. I try so hard to get on board with red lipstick, I really do but I have yet to find my dream shade. Instead I have found Illamasqua Matte Lip Liquid in Exotic to be great alternative. In the tube it appears to be a shocking orange and yet when applied to the lips it eventually settles to a bright red toned orange that perfectly compliments a tan. Admittedly the Illamasqua Matte Lip Liquids are a little tricky to apply but once dry they do not budge even with lots of eating, drinking and dare I say it smooching. Oh la la. I will save you the visual but Rita Ora for Rimmel Nail Polish in Breakfast in Bed is the perfect mint green for the toes. It is pale, milky and has a slight shimmer which you can only really notice if you are up close and personal. The shimmer element is what puts me off applying it to my fingernails but for my feet it is perfection. I should mention it applies fairly even and doesn't require several coats to become opaque. I oddly had it my mind that this line would be scented...no idea where I got that from though? Anything I should be checking out?